Disfrute de piscina comun, cuarto familiar, control de acceso, BBQ, sauna, cancha de tenis, gimnasio, lavadora, secadora, salon de juegos, horno micro-ondas, acondicionadores de aire, vista al mar o frente al mar, gazebo, mini golf, playa, patio, servicio eléctrico y de agua potable. Aquatika is a resort type complex. This penthouse will provide you and your family an unforgettable vacation experience. 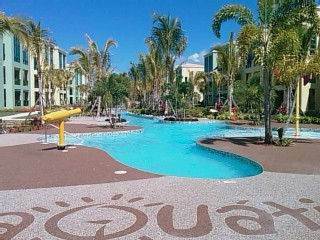 Step out into the water park right in front of your building or any of the other 4 pools and various jacuzzis the Aquatika complex has to offer. In addition, you can enjoy the beach just steps away and have some sunbathing, swimming, snorkeling, kayaking, windsurfing, or any other activity you wish to engage in. Aquatika also offers a clubhouse with two large screen TVs, lounge, fitness center, sauna, and terrace. Play outside at the kids' playground, the beach volleyball, basketball or tennis courts and the mini-golf course. Enjoy a picnic in the two gazebos by the beach next to the four charcoal grills, or just sit back at the penthouse's private terrace and enjoy the ocean breeze, the sun, the stars and the moon.